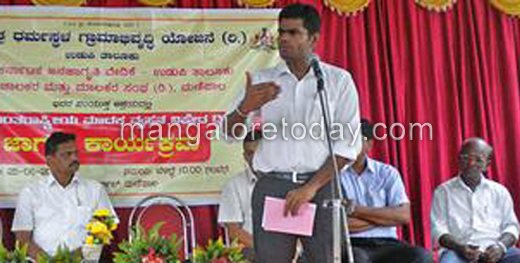 Udupi, June 27, 2015: Udupi SP Annamalai, Speaking after inaugurating the International Day Against Drug Abuse and Illicit Trafficking organised by Sri Kshetra Dharmasthala Rural Development Project (SKDRDP) and other organisations June 26, said that efforts were on to declare Udupi as a “public smoking-free district” by July-end. SP Annamalai also said that the district had taken effective steps in implementing the Control of Tobacco Products Act. As a result, the number of people smoking in public had come down considerably. Already Chikkamagaluru, Kolar and Gadag districts had been declared as “public smoking-free districts”, he said. The SP informed that autorickshaw operators could play a vital role in reducing public smoking. They spoke about several things such as politics and cricket to their passengers, whom they ferried daily. They could subtly inform, about 20 passengers a day, to avoid smoking in public and also about the ill-effects of drug abuse. If sincere efforts were put in, it might be possible to declare Udupi as a ‘Drug-abuse free’ district in a year or two. The SP stated Punjab now had the highest cases of drug abuse. Karnataka, Andhra Pradesh and Tamil Nadu were in the middle group as far as drug abuse was concerned. He lauded SKDRDP for holding alcohol de-addiction camps. As many as 3,000 persons were de-addicted, he said. Sunita Naik, president of Udupi Taluk Panchayat, Pratap Shetty, president of Taluk Janajagriti Samiti, Ramesh Kanchan and Narsimha Nayak, municipal councillors, Malati Dinesh, Project Officer of Udupi taluk unit of SKDRDP, were present along with a large audience of the young.